It happens more than one might expect: a homeless person is unable to prove identity when asked by a police officer. A transgender person doesn’t have an identification card that matches the person’s name and appearance. An undocumented immigrant might have no ID at all. More than 140,000 Boston residents face these challenges, according to one city study, and now civic leaders are taking early steps to resolve the problems by proposing a city ID — the “Boston OneCard” — for all residents regardless of immigration status, home status, or gender identity. 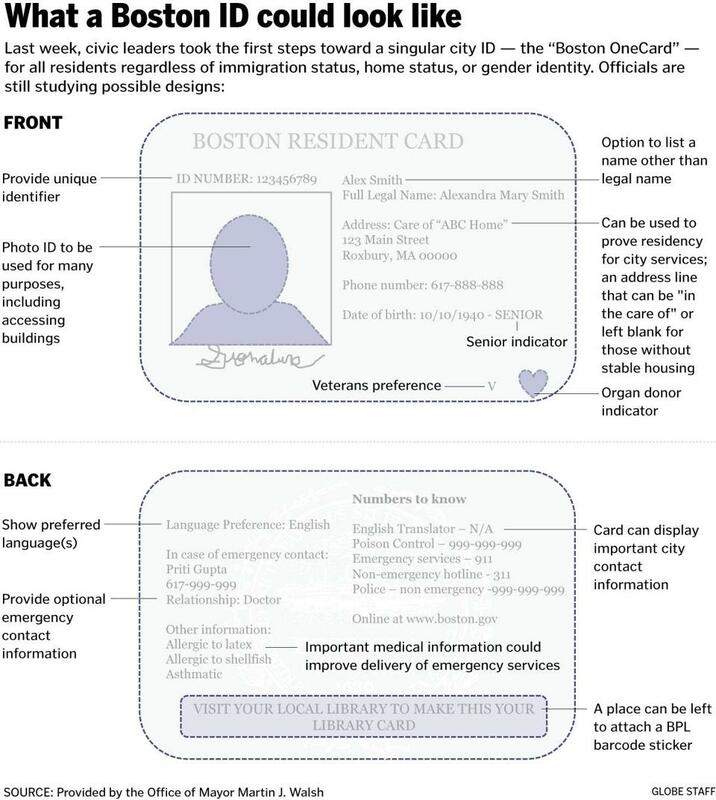 The idea is still in the initial stages of development, but under one proposal the card would include a person’s name, date of birth, phone number, and a unique identification number for Boston residents. The card would not be mandatory, but officials are proposing incentives to encourage all residents to obtain one — even if they currently have a government-issued driver’s license or state ID. Backers of the idea suggested that the card could include other municipal benefits, like discounts at cultural institutions or bike-sharing programs. “We can wrap in a library card, MBTA card function, a school ID; so slimming down your wallet, while trying to address some of these important gaps in services,” said City Council President Michelle Wu, a leader of the effort along with Felix Arroyo, the city’s Health and Human Services chief. Boston Mayor Martin J. Walsh has praised the concept. Walsh, in the city’s recently signed budget, allocated $100,000 in funding for the first steps toward a “Boston OneCard” program. According to an internal study provided by the mayor’s office, 140,709 city residents face challenges obtaining a government ID. This means about one-fifth of Boston’s population could have difficulties opening bank accounts, cashing checks, making credit card purchases, applying for jobs, accessing buildings, and interacting with police, the study found. Similar local ID programs have been rolled out in New England cities such as New Haven and larger metropolises, including San Francisco, New York, and Washington. But the program’s success, according to the city’s study, “depends on alleviating concerns about fraud.” Police and banks must independently decide to accept the card as valid identification. Jessica Vaughan, director of policy at the Center for Immigration Studies, said she worries the Boston OneCard could lead to rampant misuse, especially by criminals looking to conceal their identity. A person applying for a OneCard could have the option to list a nonlegal name, have no gender marker, or add a group who is caring for him or her — instead of a traditional address. Laura Rotolo, an attorney for the American Civil Liberties Union of Massachusetts, said the city must be careful about which officials have access to the ID cards’ data. “A health worker shouldn’t see what book you take out [at] the library, and the librarian shouldn’t see your health records,” Rotolo said. According to The Center for Popular Democracy, a liberal-leaning nonprofit group that published a paper in 2013 on municipal IDs, the idea was started in New Haven in July 2007. The “Elm City Resident Card” was partly launched in response to a high rate of cash thefts among undocumented immigrants. Few could legally open bank accounts because of lack of proper identification, the study said. In Boston, Arroyo hailed the project as potentially a “big deal” for the city. In Boston’s study, which compiled opinions from 16 city departments and four outside agencies, public safety improvements were hailed as the card’s “best opportunity” for success followed by access to financial institutions. Barbara Trevisan, the spokeswoman for the Pine Street Inn, one of Boston’s largest homeless shelters, said the card could help the city’s patchwork of emergency housing providers work more efficiently. The Department of Health and Human Services, Arroyo said, is working “very closely” with public safety and the city’s banking institutions to ensure any potential card design is secure. “We don’t want to set it up so that no one could get the ID, and we don’t want it that everyone could get the ID,” Arroyo said. Another challenge for a OneCard program is creating broad appeal. If the OneCard is used only by homeless or immigrant communities, it could become a shaming technique — a Scarlet Letter — for the same marginalized communities it was intended to help, Wu said. The Big Apple version of OneCard, called ‘IDNYC’, includes additional benefits designed to attract a broad swatch of the city and boasts nearly 700,000 cardholders after its 2015 launch. Vaughan, the immigration studies policy director, said she remained skeptical.